Working Here | Careers Europe | Mondelēz International, Inc.Working Here | Careers Europe | Mondelēz International, Inc.
"Our belief in the power of big and small is an affirmation of what makes our company so special. We celebrate the power of big with our power brands, global innovation platforms, and being ‘open and inclusive’. But we also embrace the power of small… by fostering an entrepreneurial spirit, acting like owners and keeping it simple." Why big? 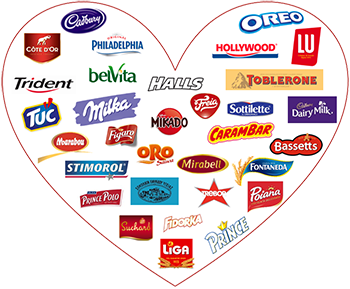 Because we’re the world’s leading maker of Chocolate, Biscuits, Candy and Gum with billion-dollar brands like Cadbury, Milka, Prince and Oreo. We’re ranked #1 in chocolate, biscuits and candy, and #2 in gum. What’s more, we employ over 100,000 people worldwide and market products in around 165 countries. Why small? Because we’re quick and nimble and never afraid to make a bold decision. We pride ourselves on working with speed and creativity. We go out of our way to hear everyone’s point of view, and develop local roots wherever we go. It’s this combination of big and small that drives everything we do, and enables us to create delicious moments of joy for people all around the world. From the processes behind our products to the strategies that help us market and sell our brands, we’re always looking for better ways of doing things. At Mondelēz International, innovation isn’t just a nice sentiment. It’s an essential component, as important to our success as any ingredient. One that allows us to create the products our consumers want – and spread little moments of joy in the process. Every year we invest heavily in developing new products and improving existing ones. In fact, we have about 1,000 Research, Development and Quality (RD&Q) employees at our six main RD&Q centers across Europe, all of whom drive innovation throughout the business. It’s safe to say that without RD&Q’s willingness to try new things, we wouldn’t have created many of the products our consumers love. Products such as "Cadbury Marvellous Creations", a chocolate bar with surprising ingredients like cookie nut crunch and jelly popping candy, or Belvita biscuits, which offer sustained energy levels for a whole morning to people on the go. No matter which office you join, you can expect a fast-paced, constantly-changing environment. One in which you’ll get to work with a variety of people both inside and outside the company, from a range of business areas and markets. All while experiencing different brands. You’ll enjoy excellent facilities, endless development opportunities and real recognition for your work. We want you to thrive. That’s why we foster a culture in which people believe in each other and want to grow together. One in which you’re given the chance to lead and have your ideas heard, but also in which you’re encouraged to help others too. It’s part of what makes the experience of working here so rewarding. We’re serious about helping you grow. The more you develop your talents, the more opportunities will open up for you. Which isn’t just good for your career, but our business as well. Join our team and we’ll offer you everything from on-the-job learning and one-on-one support from your line manager, to workshops, training programs, e-learning opportunities and virtual classrooms. We also provide special learning weeks and help towards earning professional qualifications. No matter what stage you’re at in your career, we have a development program to suit your needs. We even have a unique international assignment program for people who want to experience new cultures while they’re still starting out. In a company like ours, it goes without saying that you’ll have access to diverse career experiences that can span brands, functions, countries and even continents. Who knows? If you show you can take ownership and help others thrive, you could even turn into one of our future leaders. Our success is down to people like you. People who come up with big ideas and then put them into action. People who take small steps every day to bring us closer to our customers and consumers. People who drive us forward and make us better. Our people give us a lot, so it’s only natural we should give them a lot in return. We will offer you a highly competitive salary and an impressive array of benefits, not to mention a generous holiday entitlement. The specific benefits you receive will depend on your location, and can include anything from a company pension scheme to full-funding for relevant qualifications. Whatever country you’re in though, you can be sure that we’ll recognize and reward your contribution. To really understand what Mondelēz International is all about, you need to understand the seven values behind everything we do. Through our call for well-being we bring business mindset and the power of global resources to address the critical societal issues in the communities where we do our business. We also look after our consumers, the farmers who grow our ingredients, the communities we work in and the planet we call home. Learn more about any of the many ways in which we're creating greater well-being. We know we have a critical role to play in enabling consumers to snack mindfully. That’s why we’re gradually transforming our portfolio to offer more nutritious products. In fact, by 2020 our aim is to generate a quarter of our total revenue from our Better Choice products. By the same year we also aim to reduce the amount of sodium and saturated fats in our products by 10%, and increase whole grains by 25%. As Europe’s largest biscuit maker, with much-loved brands like Oreo, Belvita and LU, we need a sustainable supply of quality wheat. Not only is it important for our business, but for local farming communities and the environment as well. That’s why we created Harmony, a successful wheat-sourcing program. In 2012, we also invested $400 million in Cocoa Life, a ten-year program to empower over 200,000 farmers and more than a million people in our six key cocoa growing regions by 2022. Our holistic approach is focused on five key areas: farming, community, livelihoods, youth and environment. That’s not all. By the end of 2015, we will have cut our waste and greenhouse gases by 15% in manufacturing, eliminated 50 million pounds of packaging and required our suppliers to achieve 100% traceability. We’re always looking for new ways to give back to the community. In fact, we’re investing $50 million in community partnerships to promote healthy lifestyle programs. Our partners share our vision to change the course of obesity by providing people with the education, tools and access to lead healthier lives. Initiatives such as: Klasse2000 in Germany, teaching health and life skills to one out of every eight primary schoolchildren nationwide; The Alicia Foundation seeking to improve the eating habits and physical activities of teenagers in Spain or the UK Health for Life program helping at-risk children and their families in the south of Birmingham lead healthier lives. Each of our partners is recognized in driving positive change at the community level. "The Health for Life program is exactly the kind of program other food companies should be doing – a genuine focus on education for all sections of the community about healthy lifestyles with not one mention of the brands sold by the business." Along with supporting our community partners, we also run the Global Volunteer Month, during which Mondelēz International employees volunteer on all sorts of projects relating to nutrition education, active play and access to fresh foods.